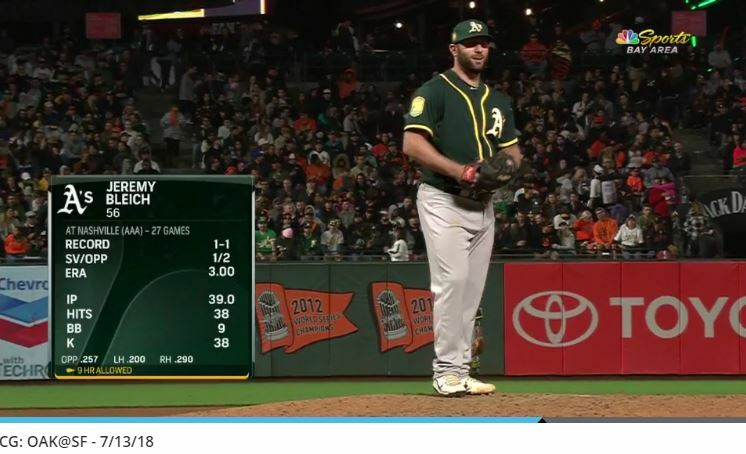 After a 10-year journey that took him through five franchises and an independent-league team, Oakland Athletics prospect Jeremy Bleich finally got the call-up and made his MLB debut on Friday. But in a post-game interview, A’s manager Bob Melvin was enthusiastic. Bleich’s journey includes a lengthy shoulder rehab — he was out of professional baseball for more than two years because of it — and a short stint in independent ball. He nearly quit the sport just last year after he was released by the D-backs following his return from the World Baseball Classic with Team Israel. “I thought I was done,” he said. Bleich considered picking up employment in New York — “Commercial real estate, medical device sales,” he said, smiling — but found himself playing for the independent Somerset Patriots before latching on to the Dodgers organization. He compiled a 3.22 ERA in 31 appearances for Triple-A Oklahoma City to cap his  season, later agreeing to a Minor League deal with the A’s. We wish Jeremy a hearty Mazel Tov and the best of luck on his next outing with the A’s.